We received a complimentary i-Mat: My Animal World in exchange for an honest review. All opinions are our own. 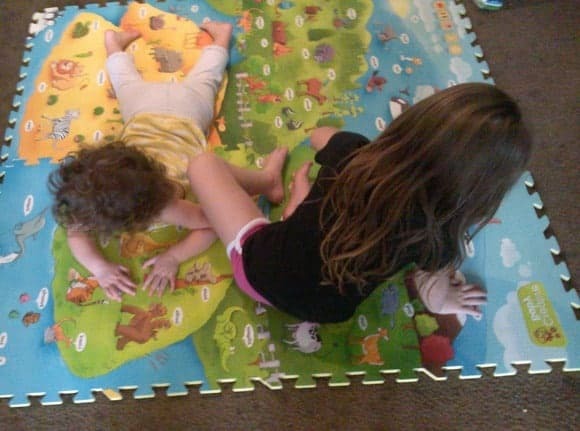 My daughters and I had the opportunity to review i-Mat: My Animal World. This unique activity set is both fun and educational. It is also perfect if you have children of varying ages. Alannah, 22 months and Mary-Grace, 4, both had a lot of fun with this educational toy. How Does i-Mat: My Animal World Work? Do Kids Enjoy i-Mat: My Animal World? The i-Mat has 4 giant foam pieces that you place together, like a puzzle. On it there are pictures of tons of different animals as well as bodies of water and plant life. It also comes with an interactive pen. When your child aims the pen at an animal, plant or body of water on the i-Mat: My Animal World, it tells them what it is and also makes animal sounds. It also comes with the neat feature of different languages. This is perfect for our household since my husband is of Mexican descent. Many members of his family speak Spanish as well as English and it is important to them that the children in the family know their Mexican heritage and also know the language. First you will need to put 2 AAA batteries into the interactive pen. Once your foam mats are placed together on the floor, just aim the pen at one of the flags. This will tell the pen which language you want. The options are English, Spanish and Mandarin Chinese. In addition to it speaking the names of the animals and making their sounds, your child can also play 2 different interactive games. Yes! Alannah and Mary-Grace love this interactive toy! Alannah mostly laid on the mat and laughed at her sister while Mary-Grace would point the pen at an animal, then repeat what the animal was. Then after the interactive pen made the animal sound, Mary-Grace would jump up and mimic it. They had a blast with this. The i-Mat is spill-proof, lightweight and can be stored easily. It has both basic and advanced educational games and teaches vocabulary and comprehension. It also comes with a USB port so you can download new sound files so your children can explore new i-Mat adventures. My children and I are very pleased with i-Mat: My Animal World and look forward to seeing what other products Creative Baby comes out with! Check out the video to see how much my kids enjoyed playing with the i-Mat! Check out i-Mat: Animal World and all the other fun iMat products at Creative Baby. Follow Creative Baby on Facebook, Twitter, Pinterest and YouTube to keep up with new, exciting products! What a great way to feel as though you are in the jungle with animals. We forget that a mat like that is HUGE to little kids. Remember those days? Contains words in 3 languages! I can teach my niece spanish! I learned that there is a voice pen that can speak 3 different languages. I learned that they do a lot of testing to make sure kids will enjoy it and learn. I learn that it speaks 3 languages English, French and Chinese. What a great learning tool for kids and it is easy for them to use. they test their products with families all over the world! can speak in 3 different languages! I learned that it teaches children 3 different languages. I learned that the pen is a voice pen. I learned it teaches in 3 different languages! The pen speaks in English, Spanish and Chinese, that is awesome! I learned that you just touch the i-Mat and it tells you the animals name, plays the animal sound and music as well! I love that it has the words in 3 languages as well! I watched the video from the customer and I learned that the mat is extremely durable and the voice pen is very easy to use! I also learned that different music plays after each animals! I learned that there are different levels of gameplay and it speaks in 3 other languages! I learned that this mat teaches children in three languages. What a fun way to learn! I learned it has words in 3 languages. That the activities include three languages – thats great! I learned that the iMat is easy enough for even young children to operate and learn on. The little boy in the bottom video is so adorable and amazing with the iMat. I like it has 3 languages as options. I learned that it speaks in 3 different languages! I can’t wait! I learned that the pen is a “voice pen.” How cool! I like that kids can learn in 3 languages: English, Spanish and Chinese. I learned that it’s interactive. I learned it has other languages. I learned that it is award winning. It teaches in English, Spanish and Chinese. I learned that they test their product all over the world with different families! I learned and loved the fact that there is a voice pen!!! I learned the imat voice pen can speak in 3 different languages! I learned that there is a voice pen, how cool!! I learned they they test their products with families all over the world to determine what works best to engage children and parents in a family setting. I learned that the pen is a “voice pen.” Our kids would LOVE this! I learned they can have fun while learning and interacting. This looks like it would be super fun for the kids to have and would help with learning. Great giveaway. I may have learned a spanish word for giraffe? 🙂 Seriously though, it looks great! Looks like the I mat and pen is the only thing they have. It looks like an awesome product! I would love to win it for my kiddos. My grandsons would enjoy the -Mat™ Set (Pad & Voice Pen™) My Animal World. 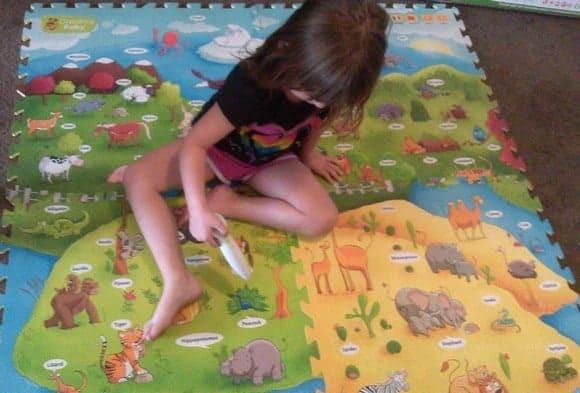 My 2 year old granddaughter was just adore playing with the I-MAT™ SET (PAD & VOICE PEN™) MY ANIMAL WORLD.